BANGKOK, Thailand (CNN) -- At least 59 people were killed in a fire that broke out early Thursday at one of Bangkok's most upscale nightclubs, where about 1,000 revelers were ringing in the new year, Thai police said. 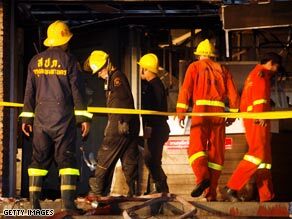 Rescue officials work at the scene of the fire in Thailand. Most of the dead were Thai, but foreigners have been identified, among them from Australia, the Netherlands, Nepal and Japan, police said. Another 100 people were believed injured. The fire, at a club called Santika, started at about 12:35 a.m. (1735 GMT), police told CNN. Most of those who died in the building suffered smoke inhalation or were trampled in a rush to get out of the club, they said. British citizen Andrew Jones said he was celebrating in the area when he walked up on the fire. He said he saw victims being rushed out of the fire on stretchers and spoke to witnesses, including a fellow Briton who saw fireworks being lit onstage. "He immediately ran out of the building, but immediately when he'd done that the lights went out and he couldn't see," Jones said. The club is located in one of Bangkok's busiest commercial districts. Its Web site features images of bands and DJs performing on both indoor and outdoor stages, and says that it "innovatively blends the comfort of nature with the excitement of the Bangkok nightlife." The site advertises the club's new year's party, which was named "Goodbye Santika."